Hello Rakkan Ramen Redondo Beach! After visiting Tokyo late last year, I truly found an appreciation for all things “umami.” What exactly is umami you may ask? Umami is actually one of the five basic senses. The other four being sweet, sour, bitter and salty. Rakkan Ramen is all about umami and offering dishes that are full of flavor. There’s five locations in Japan; four of which are in Tokyo. No need however to fly all the way to Tokyo however to get a taste of Rakkan Ramen because there are actually three locations in the USA and they are all in Southern California! The three locations are in downtown Los Angeles, Santa Monica and Redondo Beach. The latest one to open is the one in Redondo Beach. I recently had a chance to visit the Rakkan Ramen in Redondo Beach and my senses were instantly transported back to Tokyo. My meal here first started off with their Rakkan Buns. There are three offerings of Rakkan Buns; pork, chicken and vegetable. My choice was the chicken buns. This starter indeed was a definition of sensory overload. Two steamed buns were filled with crispy chicken, milk, sesame, baby mix greens with teriyaki sauce and mayonnaise. I loved the melt in your mouth softness of the steamed buns followed by the delightful crisp of the deep-fried chicken. A mix of the mayonnaise and teriyaki sauce was delightfulness to the palate. After such a savory stater, next on the table was the star of the meal; the ramen. Here at Rakkan Ramen; they have four different types. Amber, Pearl, Garnet and Ruby. The ramen are just as special as the names of the gemstones they are named after. Amber is their soy sauce ramen and their most popular at Rakkan. Pearl is the salt sauce ramen that uses specially selected Japanese salt and white soy sauce. lt is Rakkan Ramen’s “healthy” ramen. Garnet is the miso ramen that is well-known in Hokkaido. While ruby is the shrimp miso ramen made with shrimp paste and shrimp slowly boiled in olive oil to concentrate the umami flavor. Upon my visit, I tried the Garnet ramen. The Garnet uses original blended miso and has vegetable broth, sesame paste, grilled pork, green onion, bamboo shoots and seasoned egg served with thin noodles. I instantly became a fan of the vegetable broth! I love that they used vegetable broth to help keep the dish healthy yet tasty. This in itself makes it a winner in my book. The seasoned egg along with the tender pork were superb. With an addition of their chili sesame oil; this ramen dish made for one hearty meal. The umami flavor was evident throughout the whole meal. I am very happy to see Rakkan Ramen in Southern California. It’s a little taste of Tokyo here at home. For more smiles, please see my Yelp review on Rakkan Ramen Redondo Beach. 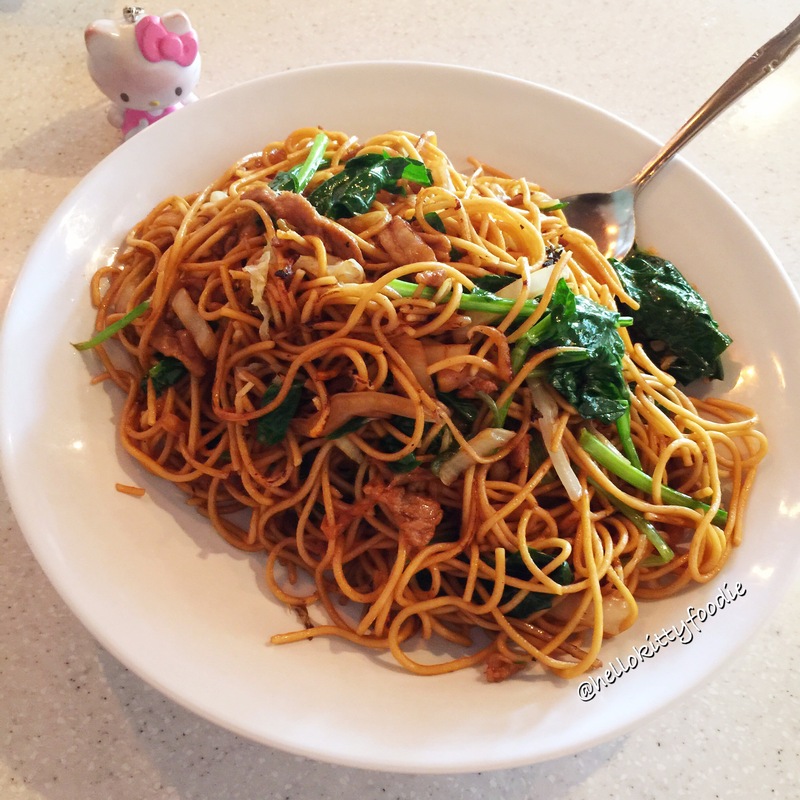 There’s a tasty new place that opened up late last year in Lomita, California and it’s no other than Tasty Noodle House. It’s a Shanghainese cuisine eatery that has several California branches. They have restaurants in Hacienda heights, Irvine, Cerritos, Chino Hills and San Diego. One of the first noticeable items is their amazing line of up of various dumplings. Their dumpling menu ranges from different vegetarian, meat and seafood wontons to different wonton soups. I first tried their Shangai Sticky Rice Shiu-Mai. I’ve always been a fan of sticky rice at dim sum restaurants. I found this shiu-mai to be so interesting because it is a dumpling with sticky rice inside. It has a chewy dumpling skin on the outside and inside is the moist sticky rice. It’s a very unique take on sticky rice. One of my favorite dumplings here is actually one of their soup offerings. I absolutely love their Shanghai Wonton Soup. It’s a very heartwarming broth filled shitake mushrooms, veggies, wonton strips and ten soft luscious dumplings. 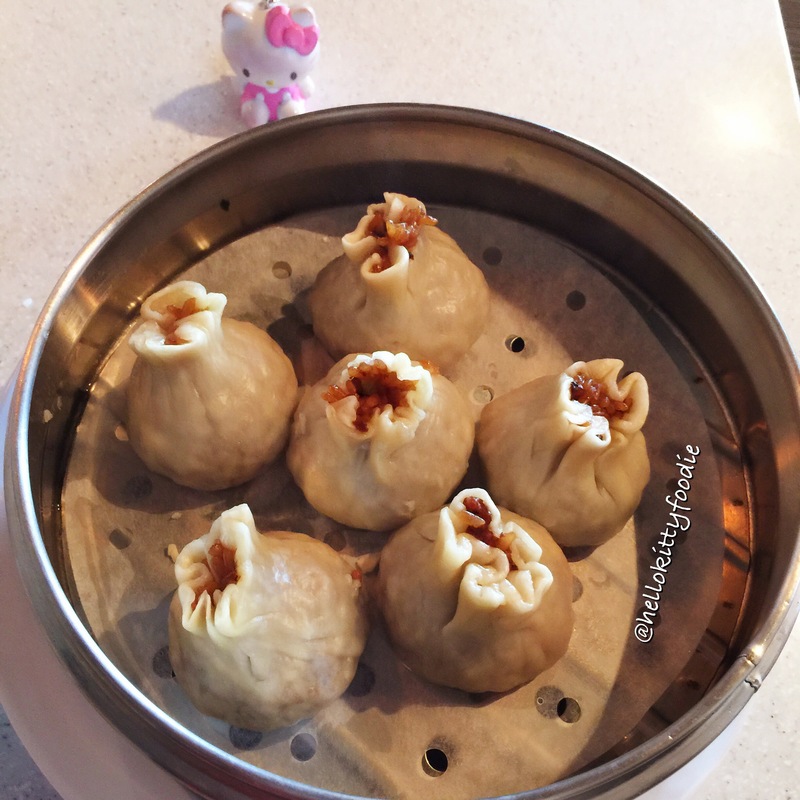 The dumplings are generously filled with flavorful pork. Speaking of pork, Tasty Noodle House has a very popular dish in their Shanghai Grilled Pork Bun. The Shanghai Grilled Pork Buns is a absolutely wonderful! They’re huge in size and are filled with a nice amount of flavorful pork. I also like the touch of sesame seeds that they have on the buns. Aside from different dumplings, they have various rice dishes. I tried their Yeung Chow Fried Rice. This is a very fulfilling fried rice dish. 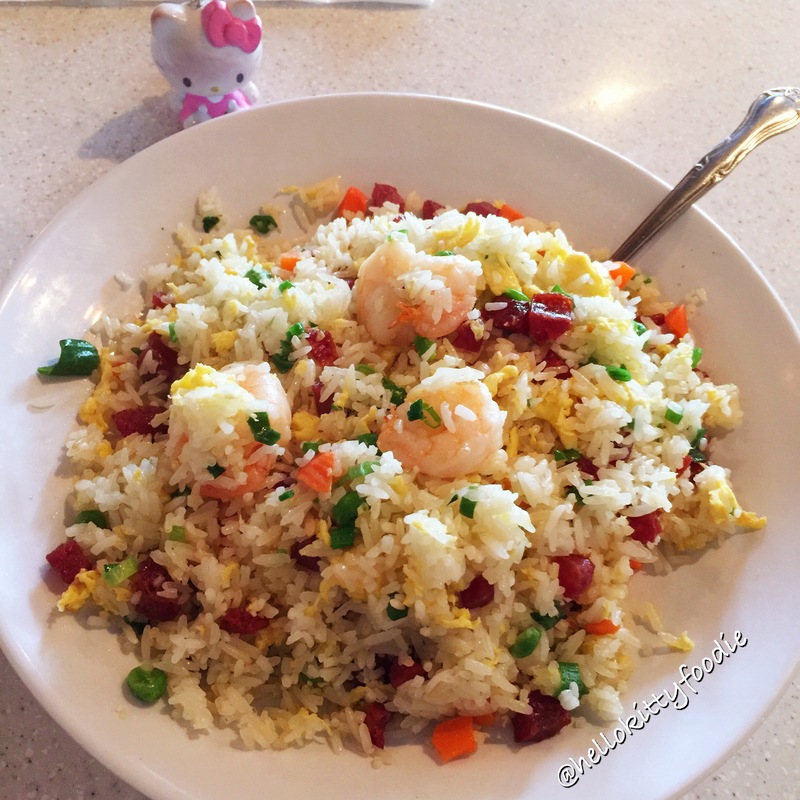 It is packed with several ingredients such as shrimp, Chinese Sausage and veggies. One of the first noodles I tried was their Shanghai Style Chow Mein. I liked how this dish had chicken and Chinese broccoli. It’s got your greens and protein. You can check off healthy eats with this one. The other noodle dish I got to try was there Basil Beef Noodles. The basil in this dish is very distinct and one will instantly taste the flavoring at first bite. 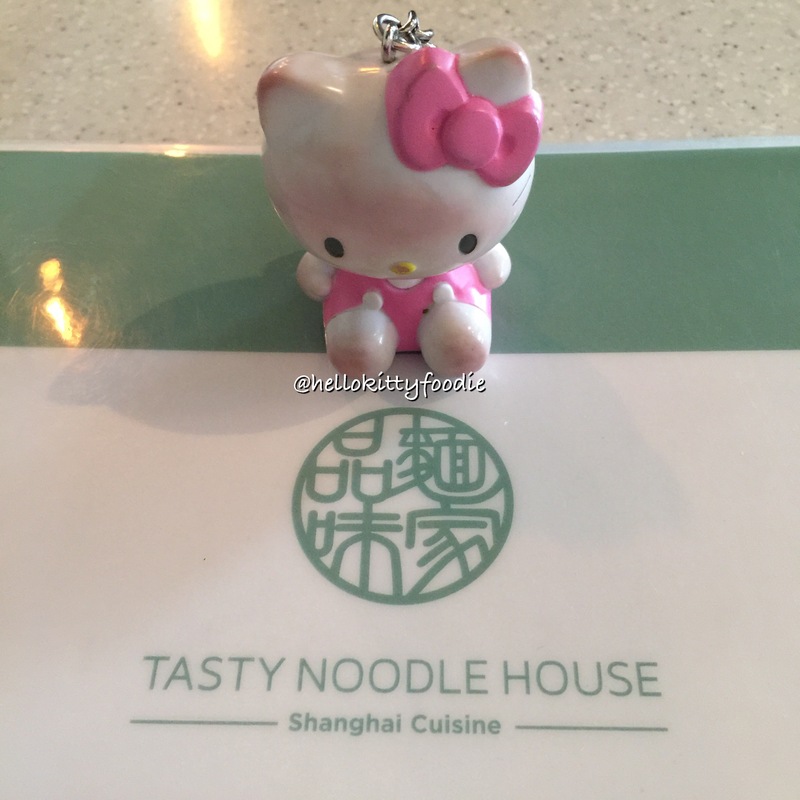 For more smiles, please see my Yelp review on Tasty Noodle House. Today’s culinary creation is homemade capellini with meatballs and mushrooms. Capellini or angel hair pasta is one of my favorite types of pasta. I love the long, thin noodles. I’ve had it many times at restaurants but it was my first time to try making this dish at home. 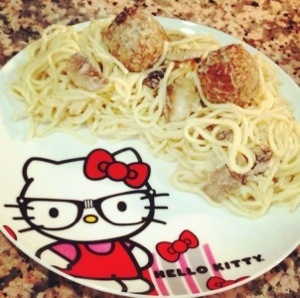 It was nice to find that angel hair pasta was fairly simple to cook. I had angel hair pasta boil for about four minutes to five minutes until the pasta was tender. I did not want to overcook it. Up next was sautéing the mushrooms and adding the Alfredo sauce to the sautéed mushrooms. The meatballs were prepared in the oven earlier because this took the longest. The meatballs were added to the Alfredo sauce and mushrooms and allowed to simmer and then the pasta was added. I love the simplicity of this dish. It is quick yet comes out very nice and tasty. Lessons learned though from my first time making this is that it is obe needs to eat this dish right away or the noodles will absorb the sauce! If you can’t serve or eat this dish right away, it is best to separate the sauce. 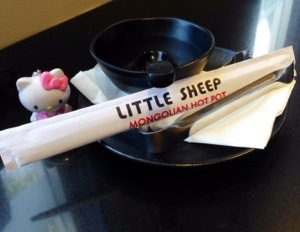 Hello Little Sheep Mongolian Hot Pot! Ahh rain, cold early mornings and chilly evenings. It’s all an indication that winter is soon coming our way! Whenever the “ber” months come along, I am always on a lookout for places offering heartwarming soups. Today I found myself at a place perfect for winter! 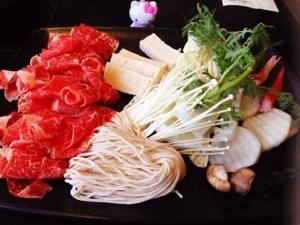 It is the new South Bay spot for hot pot, Little Sheep Mongolian Hot Pot. 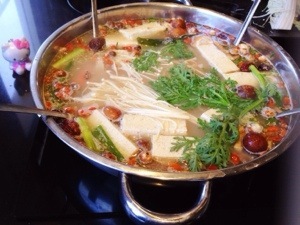 At Little Sheep Mongolian Hot Pot, they have soup bases prepared with broth that includes slow cooked chicken and beef bone marrow broth and different herbs and spices like garlic and cranberry. Customers get to choose what meats they want as well as add sauces from their sauce bar. During my trip here, I chose to get the lunch special natural angus short rib. It came with fresh cut noodle, tofu, mushrooms and seasonal vegetables. 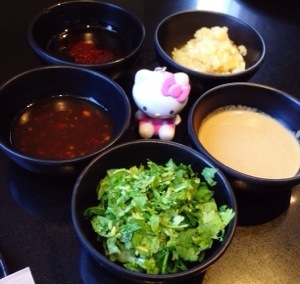 From the sauce bar, I got chili oil, garlic, house sesame sauce, green onion, cilantro and sweet garlic sauce. 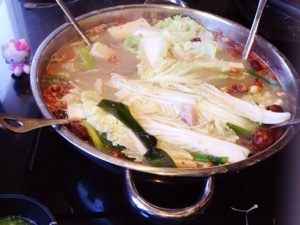 Cooking hot pot is a lot of fun and quite and experience! The pre-made soup base comes out first and is placed at the tabletop stove. 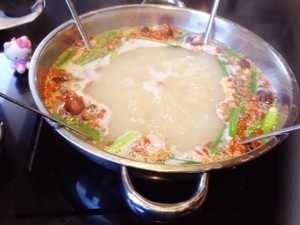 At Little Sheep Mongolian Hot Pot, they say there is 36 different herbs and spices in their soup base. Yum! 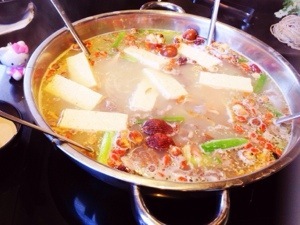 As the soup base started to get hot, I dropped in my meat and tofu to the pot! I chose to cook these first because they take the longest to cook. Next up, to go in the pot was the different veggies and potato. The last things I added were the cabbage and the noodles. Soon enough, I was on my way to eating a yummy hot pot. I loved that the broth seasoning! The different herbs and spices really brought out the flavor. Adding in some of the sauces from the sauce bar, enhanced the flavors even more. I liked the whole mix of meat, veggies and noodles! Overall, I was happy with how I got to customize my hot pot, cook it and watch it come together. It definitely was a very fulfilling meal and I’m happy to have found a new place to bring a little warmth during the cold days that are coming up! 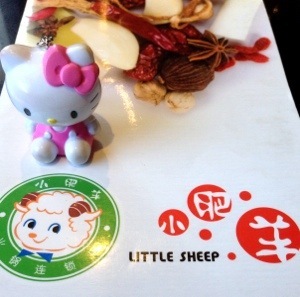 For more smiles, please see my recent Yelp review on Little Sheep Mongolian Hot Pot. Today’s culinary creation is tofu shirataki noodles! On a recent trip to a local Asian market, I was introduced to tofu shirataki noodles. They are a traditional Japanese noodles that are made of tofu and yam. After a bit of research, I found out shirataki noodles have several benefits! They are cholesterol free, gluten free, sugar free, dairy free, vegan and high in fiber! They can even help in weight loss. I found these noodles intriguing and interesting and decided to try it out. There were two versions of tofu shirataki noodles that I bought. I got the spaghetti and fettuccine. The tofu shirataki noodles already come cooked and so all I had to do was add a little boiling water and then mix in the ingredients that I wanted. For the spaghetti, I added beef meatballs and sweet Filipino spaghetti sauce. For the fettuccine, I mixed in hot dog slices and sweet Filipino spaghetti sauce. I really liked how these noodles came out when cooked. They were so soft and tender. They tasted great too! I could not tell at all that I was eating something that was low in fat and low in calories! I couldn’t even tell that they are low in carbs! It’s as delicious as regular pasta. I am a fan! It’s healthy and yummy! Yay! I really liked the tofu shirataki noodles and can see myself using these noodles for other homemade creations! 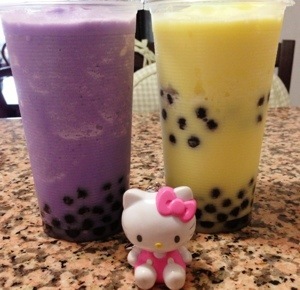 Hello Hong Kong Express combo and boba! Perhaps one may wonder why I am blogging about and writing a yelp review on a place that is a fast food joint/chain. I don’t think there is a rule of what to blog or yelp about and whether it is fine dining place or a hole in a wall, if I believe in a place, I will give the place the praise it deserves ;). I really wanted to blog about this place because I truly believed it is deserving of getting more positive feedback. I stopped by here to get a quick lunch as well as some boba drinks and was really impressed. 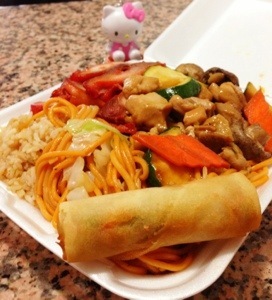 I got a two item combo consisting of fried rice, chow mein, teriyaki chicken and chicken with mushrooms and zucchini. Portion wise the combo was enough for at least two meals. The lady working there even threw in a free egg roll. Taste wise the food was delicious too! My taste buds were delighted with the succulent teriyaki chicken. Equal in yumminess was my other chosen entree. The chicken with vegetables and mushrooms had a flavorful sauce that went well with the fried rice. The side chow mein was soft and good. Equally impressive was the boba drinks here that are made to order. I really liked the boba here! The boba balls themselves are perfectly chewy and soft. The boba drink is tasty and sweet. This will be a new summer hot spot for me for drinks to keep me cool :). 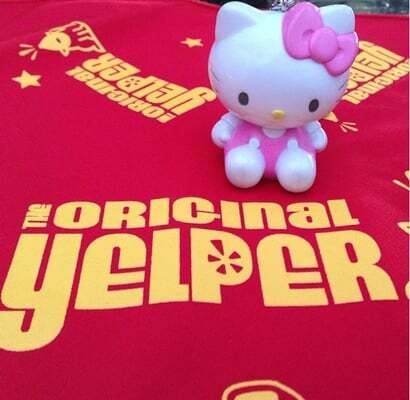 For more smiles, please see my recent yelp review on Hong Kong Express.